Dr. Reynolds is a graduate of Purdue University and Indiana School of Optometry. While in optometry school, she served as an assistant ophthalmic optics instructor to doctoral students. Her educational training includes specialty ocular disease externships at Boling Laser Center and New York Veterans Administration Hospital. 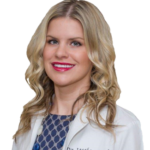 Upon graduation, Dr. Reynolds moved to Atlanta where she gained experience in both private, commercial and refractive surgical settings. Dr. Reynolds has undergone extensive training in Custom Intralase LASIK technology and LASIK co-management. She is an active member of the Georgia Optometric Association, Optometric Council on Refractive Technology, Beta Sigma Kappa International Optometric Honor Society, and is a valued volunteer for One Sight, a charitable organization providing eyecare for Atlanta students in need.